Students in grade three learn how health habits impact growth and development. They learn to compare and contrast healthy and unhealthy practices. Skill building continues as students learn to apply the knowledge of health-risk reduction to the promotion of health. Students access valid information and begin to understand the relationship between personal decisions and the impact of personal decisions on self and others. Ask students to examine the contents of the family “medicine cabinet” with a parent and list at least five over-the-counter or prescription medicines and proper dosage of each. 4-What Happens When You Eat? Have students complete the activities on an interactive body site that demonstrate digestion. Give students various examples of health care technology (e.g., wearable technology, heart rate and blood pressure monitors); have them measure and write down various results. Create collages of health technology pictures from newspapers and magazines. Have students identify three ways in which dental health care has improved over the last 50 years as a result of advances in science and technology. Have students identify three ways in which general health care has improved over the last 50 years as a result of advances in science and technology. Education Center - Eat Right! Have students complete a worksheet that calculates how much water they should drink on a daily basis and keep a log of their water consumption for a week. Have students evaluate the nutritional content of their lunch using the food guide pyramid. Have students list and explain the benefits of several vitamins and minerals. Have students plan a meal that is high in calcium and iron. Have students compare the nutritional content of two food items by using the food labels. Have students design a meal that uses all the food groups from the food pyramid. Have students make a bulletin board of the food guide and have students fill in each category with pictures of foods. After students read scenarios about people who are eating unhealthy foods and or engaging in sedentary lifestyles, have them discuss one or two overall weekly improvement goals for the people to improve their nutrition and physical activity. Students should also identify daily activities that will help the people reach the weekly goal (s). Have students complete a worksheet where they identify a weekly nutrition or physical activity goal for themselves and create a one week calendar with daily specific activities they should do to meet the goal. Have students explain different countrys’ ethnic foods, cultural traditions, celebrations, and recreational activities. Have students identify dietary customs and practices, recreational activities, celebrations, and traditions in their community. 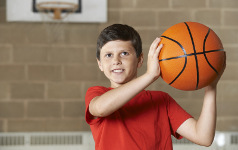 Have students develop a one-week physical fitness plan for their family that provides 60 minutes of activity a day. Have students discuss and develop a family safety plan to prevent home, transportation, and recreational injuries. Create and read two scenarios where a child experiences disappointment; in one scenario, the child handles it inappropriately and in the other scenario the child overcomes disappointment in a positive manner. Have students discuss the pros and cons of each ending. Have students further illustrate or act out constructive ways of dealing with disappointment. Have students develop posters to show classmates how to report bullying, stand up to bullying, and help friends who are being bullied. Have students role-play positive communication and interaction with friends, family, community members. Skill development remains a central focus for students in grade three as they begin to accept feedback from and provide appropriate feedback to others. Students refine, vary, and combine skills in complex situations and demonstrate more proficient movement patterns in educational games, dance, and gymnastic activities to become confident and competent movers. Students identify critical elements (small, isolated parts of the whole skill or movement) and apply them in their movement. They develop fitness knowledge and can relate regular physical activity to energy balance and health benefits. Students continue to build knowledge of body structures and systems. They know safe practices, rules, and procedures and apply them with little or no reinforcement. Students work cooperatively with peers and understand that there are many differences in movement skill and ability levels among their classmates.